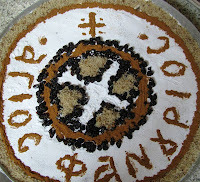 Today we celebrate Saint Fanourios, and all over Greece Fanouropites are being made. 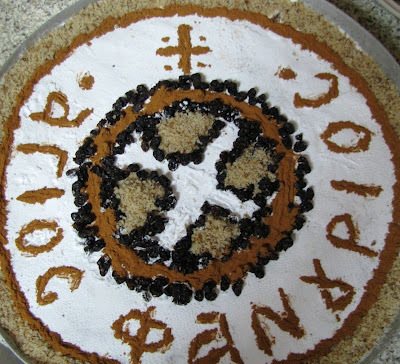 Fanouropita is a fastening pie which is prepared to honour the memory of Saint Fanourios. When this pie is ready, it is taken to the priest, and after he reads a specific prayer and gives his blessing, it is offered to the congregation and to other believers. Saint Fanourios became very popular because of the sound of his name, that seems very close to the Greek words Faino and Fanerono, which mean Show, Appear or Reveal something to a person. In Greek tradition he is the Saint that make things appear (e.g. lost ones), observed, and also points to good fortune. Greek people say many things about his achievements. They believe that Agios Fanourios reveals stolen or lost items, but also the best way a person has to take or choose. “He has been shown” they say for someone who has done well in his life, “Agios Fanourios is lighting and showing the way”. This is the reason why the figure of the saint is represented on the icons holding a candle that enlightens the way. Many people say the Prayer of Fanouropita while they make it. We write below the recipe of Fanouropita, so that when you need help from the Saint, you will make one by yourselves and he’ll assist you. 1 cup chopped nutsPut all the ingredients in a mixer (except of the flour and soda powder), and blend for a few minutes. Add the flour and the soda powder and mix them well. Add the raisins and the nuts in the end and work on the mixture lightly. Put the mixture on a buttered baking pan and put it in the oven at 180 C, for about 45 minutes. When it is baked, let it cool and spray icing sugar over it.